LETTERPRESS INVITATIONS: Custom wedding and event invitations with pieces, styles, and colors uniquely designed to fit your special day. Interested in an estimate? Click HERE to fill out a form with all of your details! Alex & Chris: Letterpress Printed Invitation Suite with custom illustrations and calligraphy. Ginny & Joe: Letterpress Printed Wedding invitations with blue mountain illustrations. Ashlee & Wich: Letterpress Printed Wedding Invitation with custom mountain illustration. Kara & Alex: Indigo and letterpress printed wedding invitation suite with custom watercolor floral illustrations. Megan & Christopher: Wedding invitation suite with custom watercolor mountain illustrations. Camille & David: Letterpress printed wedding invitation suite. Seth & Elizabeth: Letterpress printed wedding invitation, detail. Designed at 7 Ton Co.
Meg & Craig: Rose Gold Foil on kraft paper. Designed at 7 Ton Co.
Ada & Elliot: Letterpress printed wedding invitation suite with custom illustration. 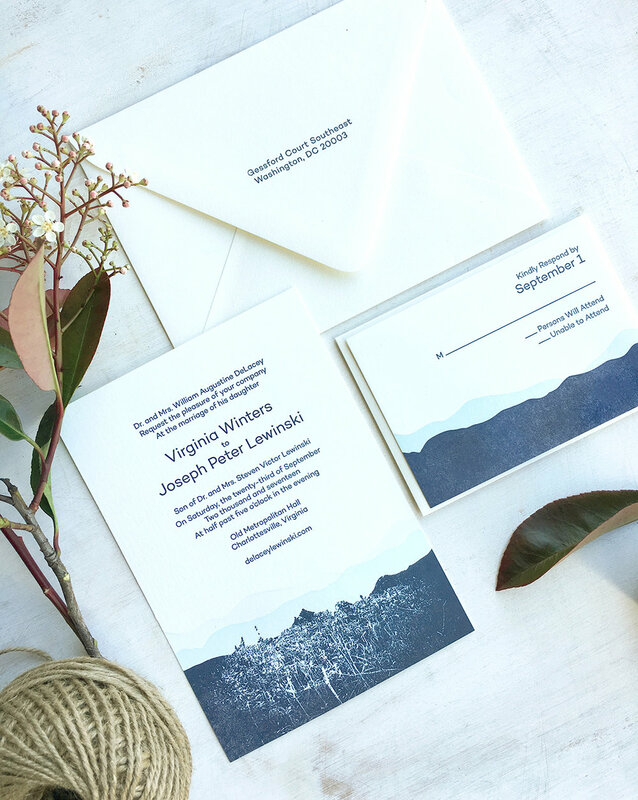 Blue Ridge Mountain: Letterpress Printed Wedding invitation suite. Customizable. Maria & Jeremy: Letterpress printed wedding invitation. Designed at 7 Ton Co.
Taylor & Christopher: Letterpress printed wedding invitation suite. Designed at 7 Ton Co.
Ada & Elliot: Letterpress Printed invitation suite with custom illustration. Raimey & Andrew: Letterpress printed wedding invitation suite. Designed at 7 Ton Co.